EMS Safety will be a keynote presentation at India's first NiEMS conference February 24th, and also featured in Dubai's International Ambulance Conference DIAC March 7th. So we shall be at EMS Today only virtually via twitter #EMSToday from @EMSSafetyfdn this February. Big Congratulations to the: Annual EMS Safety Foundation Award recipients. 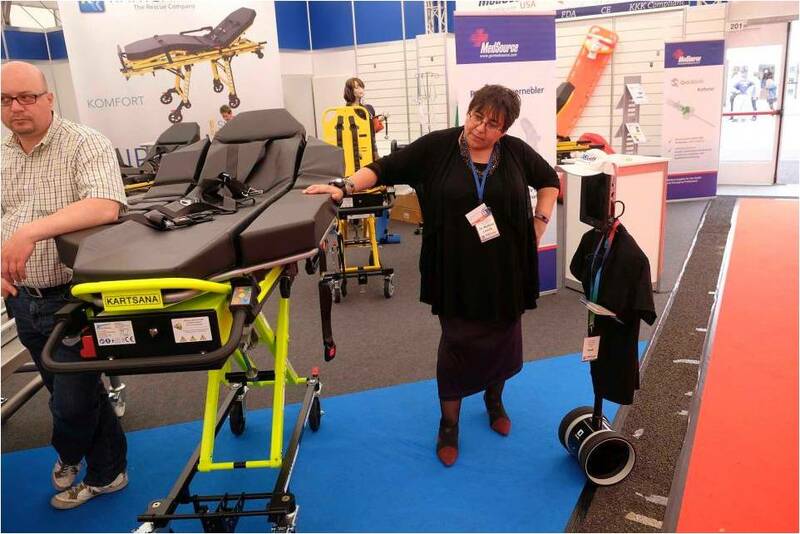 EMS Safety Foundation INDEMO Project innovation @EMS World 2017! 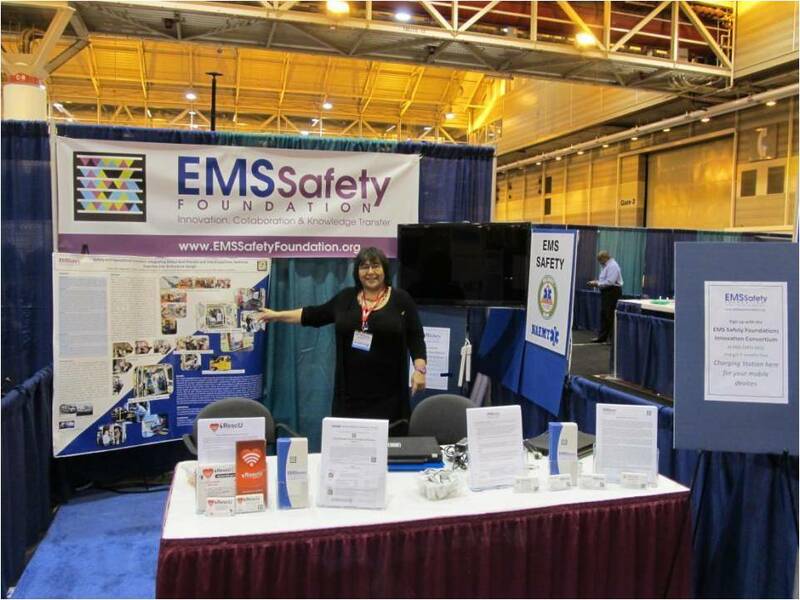 The EMS Safety Foundation's INDEMO project and iRescU Project were some of the many highlights at EMS World Expo 2017. 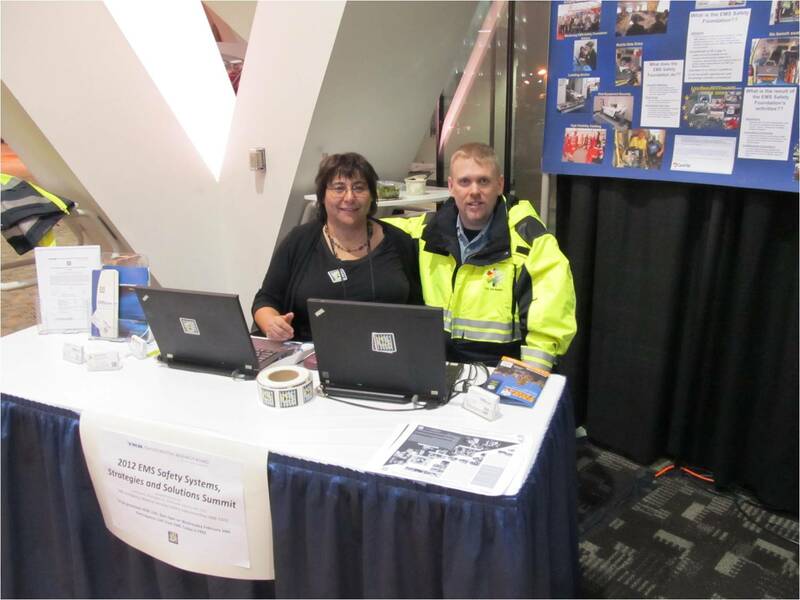 The hard working EMS Safety Foundation team - led so impressively by Josh Wheeler, EMS Chief, Winthrop Maine - gave the delegates at EMS World Expo a great and hands on perspective of the work of the EMS Safety Foundation, sharing safety innovation with you all. The Exhibit floor was huge, with so much to see. The constant stream of folks from the learning center and Randy Mantooth just by us @ Booth 411, sure kept us all very busy at EMS World Expo. We also launched the first phase of the iRescU project at EMS World Expo, crowdsourcing public access AED locations - so you can now be part of augmenting existing AED geolocation data for us all, with just a smart phone or a camera! Big Congratulations to the: Annual EMS Safety Foundation and Objective Safety Award recipients. Amazing, great work by you all, thank you to you all for your extraordinary contribution to the field of EMS and our society. EMS Safety Foundation INDEMO Project innovation @ EMS TODAY 2017! INDEMO 1.0 Module @ EMS Today in Salt Lake City. 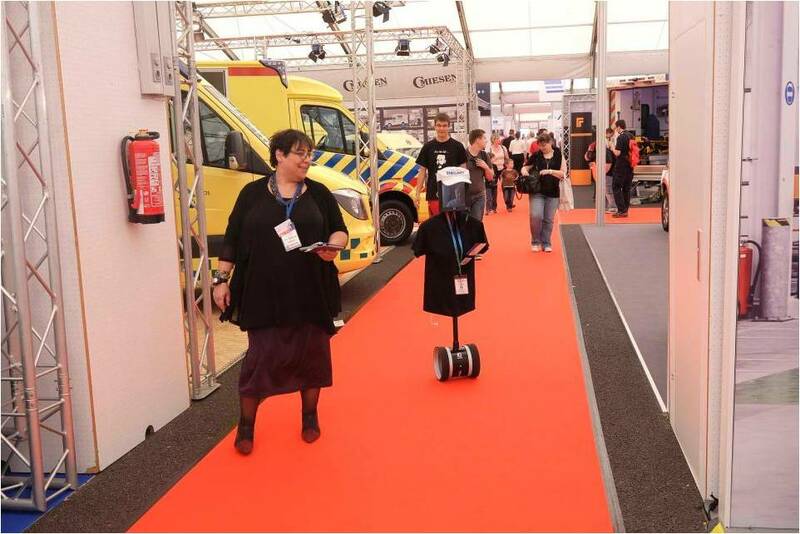 The EMS Safety Foundation's Inovation Consortium Delegation is heading over to Rettmobil 2017 - May 10-12 - with Andi the telepresence robot - AND a social media team. It was great to beam in colleagues from around the world. Last years Rettmobil 2016 was bigger than previous years with record attended Rettmobil - with much to see and learn for all. 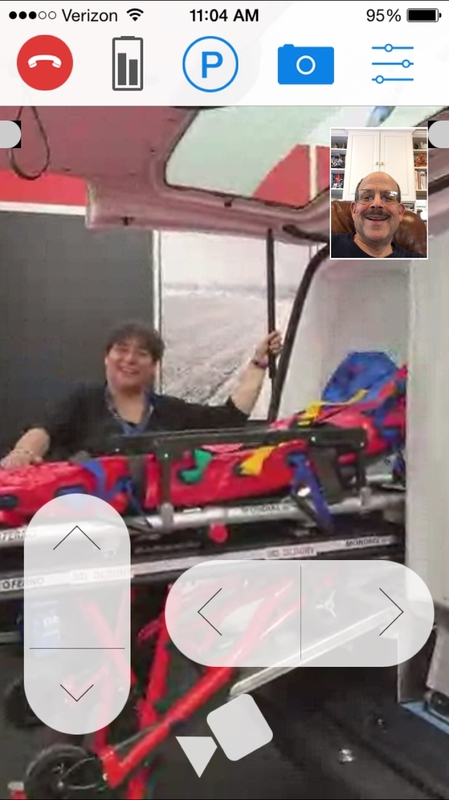 We were fortunate to have Jeff Armstrong @JEFF_EMT embedded with our delegation - and Evie McNee managing our social media interface - sharing info with you live via twitter, periscope, instagram to bring the best of Rettmobil back to you, live. We also held our first tweet chat with EMS World, which we shall be holding again this year providing live Q nd A.
slots with our delegation are already filling up fast. Priority is to members of the EMS Safety Foundation Innovation Consortium. 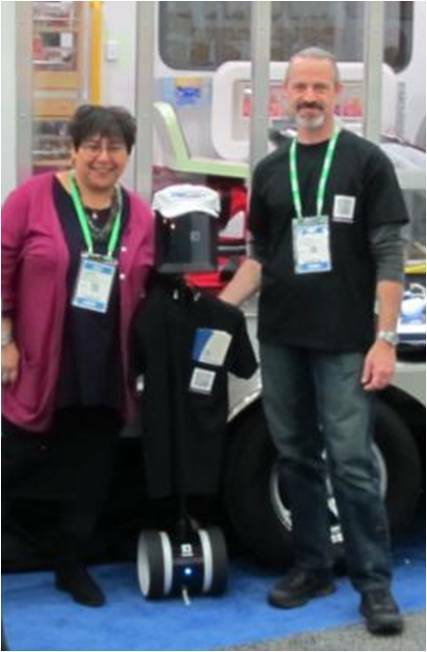 The EMS Safety Foundation's Inovation Consortium Delegation is now back from a dynamic expedition to Rettmobil 2016 - with Andi the telepresence robot - AND a social media team. 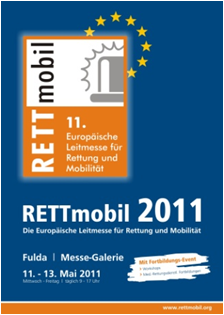 It was a bigger and record attended Rettmobil - with much to see and learn for all. We were fortunate to have Jeff Armstrong @JEFF_EMT embedded with our delegation - and Evie McNee managing our social media interface - sharing info with you live via twitter, periscope, instagram to bring the best of Rettmobil back to you. It was great to beam in colleagues from around the world. As well as being joined by Crestline Ambulance on site. 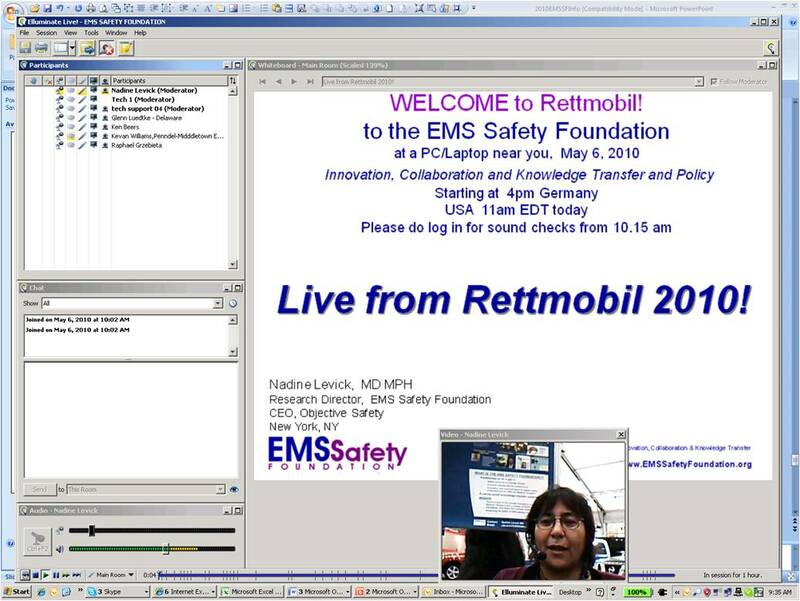 Here is the link for the EMS Safety Foundation May 12th 2016 LIVE from Rettmobil Webinar, for the EMS Safety Foundation IC/TEP November Webinar for members of the Innovation Consortium and Technical Expert panel, Advisory Board and Corporate Partners via secure Login and Password access only. The internet connection was a bit slow so slides and sound synch is a little out. Complete this Virtual Telepresence form online , with your preferred 15 minute to 60 minute virtual tour time - between 08.00am and 11.00 am EST on Wednesday, Thursday and Friday May 11th to 13th, 2016. 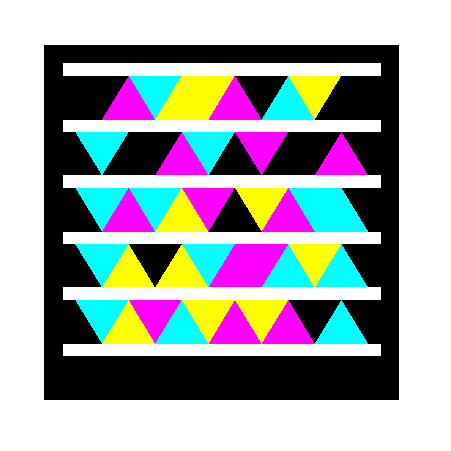 Connection with Andi can be made with any laptop or android tablet, or a windows desktop running a recent version of Google Chrome. Also any android phones with Google Chrome can drive the robot seamlessly, though the small screen size is a limitation. 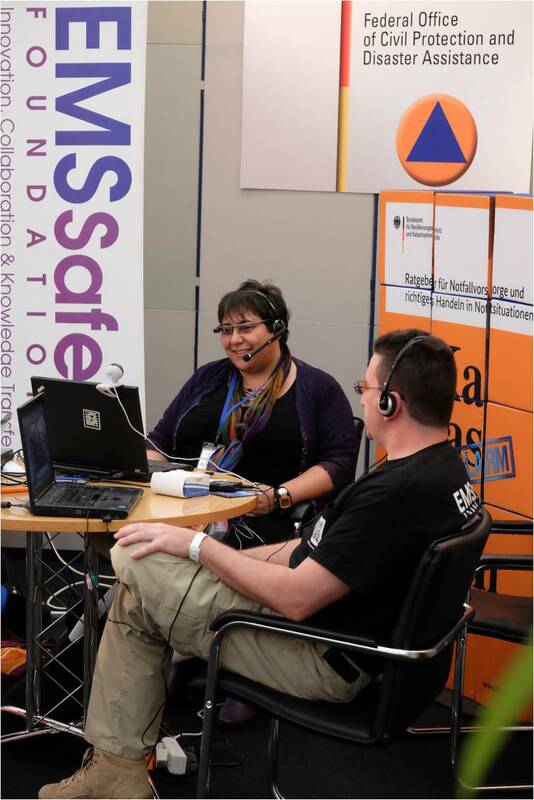 So yes, you can now, with the EMS Safety Foundation, take pictures in Germany without even being there!! EMS Safety Foundation INDEMO Project innovation @ EMS TODAY 2016! 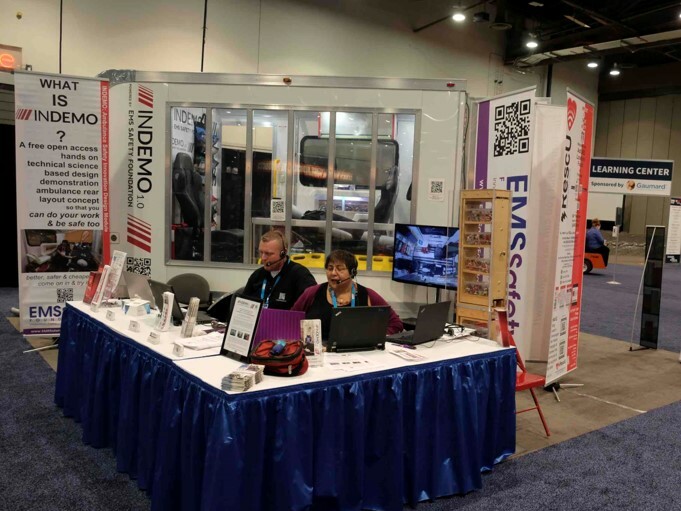 Many folks came by to get their hands on the INDEMO 1.0 Module @ Booth 3343 at EMS Today in Baltimore. Click on the images above to see the voice activated LED lights! Didn't make it to EMS Today...? You can now schedule your own 'self-drive tour of INDEMO from any tablet, smart phone or PC near you, from anywhere in the world!! Would you like to schedule a Virtual or an Onsite tour of INDEMO 1.0 ?? Click here to Schedule a Virtual self drive Andi tour or an Onsite tour of INDEMO 1.0 . Just fill out this form - and a link to access Andi - our telepresence robot can be sent directly to you - so you can explore the INDEMO module driving Andi the robot from where ever you are! Oct 25, 2015 is a special day, as the EMS Safety Foundation released its Neonatal Transport System Safety Concepts White Paper at the American Academy of Pediatrics Annual National Conference, in DC. 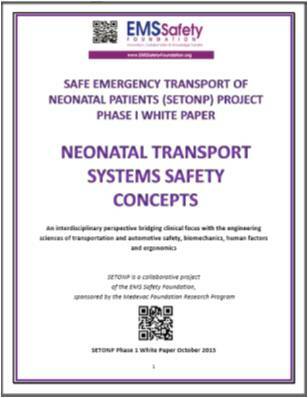 This White Paper is a product of the EMS Safety Foundation's Safe Emergency Transport of Neonatal Patients (SETONP) phase I project funded by the Medevac Foundation. Health care folks talking with engineers, transportation scientists, designers, biomechanists and ergonomists and visa versa, is as key as it is challenging. It became clear to us early in the project that a document that covered facilitating that dialogue and collaboration was key to us, and would be of great value to our broader colleagues. And this is that preliminary document, and in many ways just a tip of the iceberg. 1. It was developed by a group of interdisciplinary colleagues on three continents in disciplines ranging across - systems engineering, biofidelic and biomechanical engineering, vehicular occupant protection, operational ergonomics, fleet management practice and transportation safety system in addition to expertise in operational neonatal transport practice. 2. 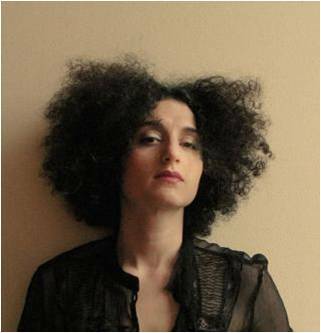 It is to be augmented with crowd sourced interdisciplinary public comment. This document is, open for public comment from all disciplines including transport engineers, ergonomists and neonatal care providers as of today at this link www.EMSSafetyFoundation.org/SETONP-PublicCommentForm.htm - so that we can make it as valuable a document as possible for the operational providers in neonatal transport. We are keen for our next Phase of this project to be optimized so we can make sure that the data and information we assemble is of maximal value to those who access it. So, many thanks to all who have been instrumental in getting this project together to date for this White Paper and the broader SETONP project, and for all the additional work that is underway preparing for the next phase of this project, to expand and augment the work done to date on this SETONP Phase I project. I specifically would like to thank the lead project team members for all their input and expertise - Prof Rob Salzar (Occupant protection engineering), Prof Al Hackel (Neonatology and transport), Chris Fitzgerald (Human Factors and Applied Medical Transport Ergonomics), Lynette Johnson (Neonatal Transport Provider), Ronald Rolfsen (EMS and Medical Transport and international standards), Prof Art Cooper (Pediatric Trauma and policy) - as well as the numerous others in the engineering, transport science and health care arenas who have contributed to the broader SETONP project. 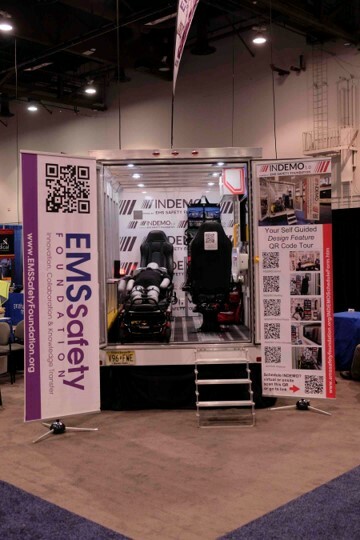 Great to see so many of you @ EMS World Expo 2015 September in Las Vegas - @ booth 471 - for you to explore the INDEMO Project hands on, and interact with our vpoice activated light system and to hear about how the EMS Safety Foundation can help save you time, lives and money! You can now schedule your own 'self-drive tour of INDEMO from any tablet, smart phone or PC near you, from anywhere in the world!! 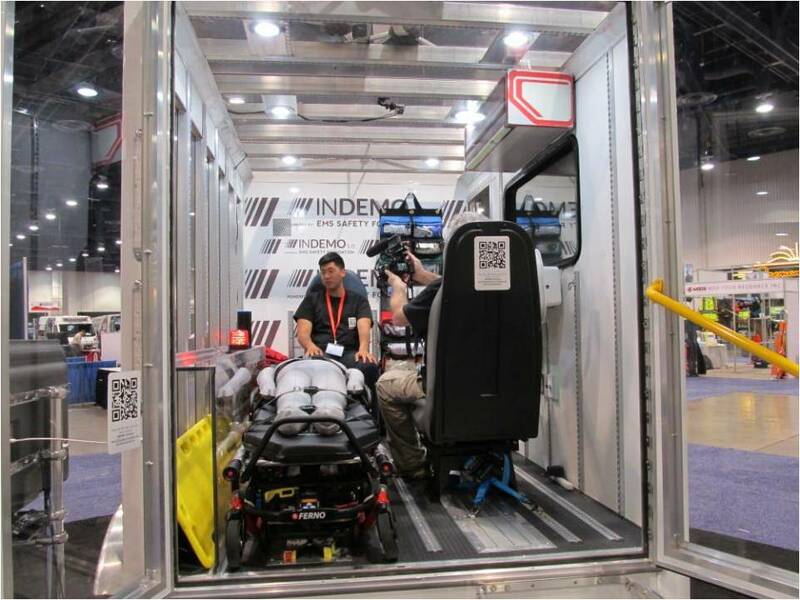 The Ambulance Safety Innovation Design Module 1.0, INDEMO 1.0 is a unique hands on demonstration ambulance rear compartment that is configurable so you can get the feel of being in a cutting edge rig. Integrating innovations from around the world for the north American market - that you can have right now for your vehicle interiors. The Rettmobil 2015 Delegation - was a great success - Andi's debut sure was valuable and caught much acclaim and attention. 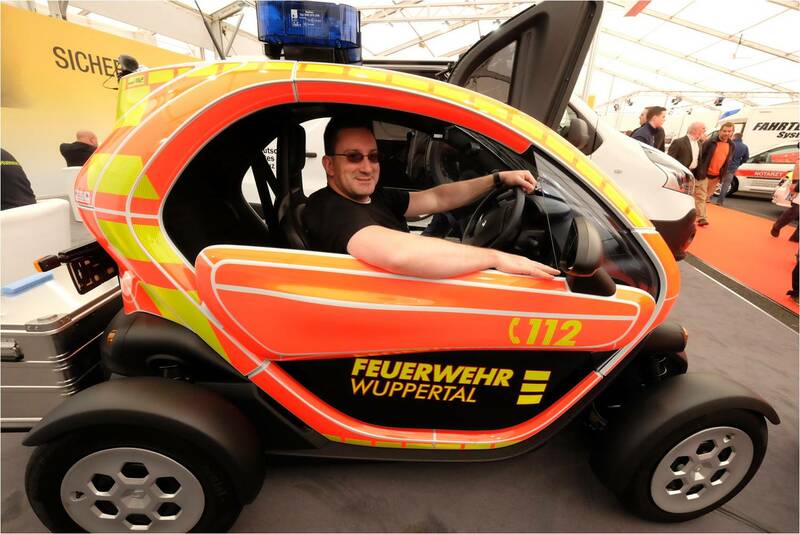 take a look at the program - EMS Safety Foundation Rettmobil 2015 Delegation Program. 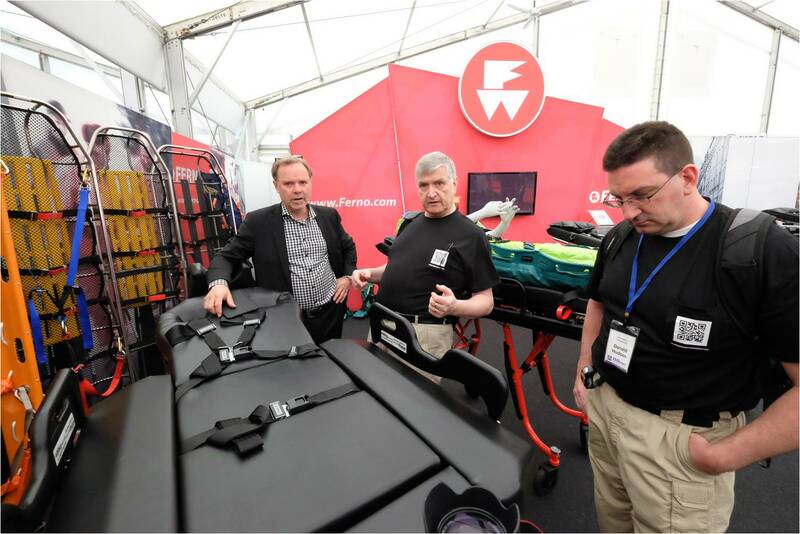 EMS Safety Foundation's INDEMO 1.0 was mobbed at EMS Today 2015 - we sure were honored as attendees stopped by and told their colleagues that "this is the ambulance of the future!" and better safer and cheaper too ! We also had 'Andi' - our new telepresence robot - join us to share innovation and design with you all, where ever in the world you may be. Many folks came by to see, touch and interact with the INDEMO Project @ EMS Today in Baltimore February 2015 - as well as with the scale models giving you a configurable and hands on experience and the GoPro rooftop camera. Meeting with some of the EMS Safety Foundation tech team, face to face . 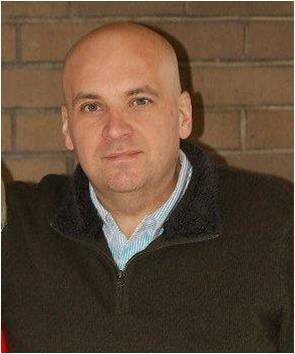 Many thanks to our talented support team - particularly Dave Turner, and his wealth of operational EMS experience and safety focus. Also, much thanks to Ronald Rolfsen, Ted Setla - videographer extraordinaire and our intern Joey Bottari. Gratis for EMS Safety Foundation Innovation Consortium Members. Connection with Andi can be made with any laptop or android tablet, or a windows desktop running a recent version of Google Chrome. Also Samsung galaxy smart phones (and any android phones with Google Chrome) can drive the robot seamlessly, though the small screen size is a limitation. Please do consider a quick practice test over the next 48 hours - just call me (917 992 2979) to set up a live test link for you or skype 'Objectivesafety'. 1. After this Virtual Telepresence form is submitted, a web link will be emailed to you, allowing access to the robot at your allocated time. 2. Just prior to the scheduled time, open the email and click on the link, or copy and paste into the address bar of the Google Chrome browser. 3. Once a connection is established, the screen of your device will automatically show the robot's view. If you have a front facing camera on your tablet or a web cam on your laptop or PC, your image will appear in the upper right corner of your screen. 4. You will 'see' what the robot can see in real time. Directional movement of the robot is controlled by you with the onscreen arrows on tablets and smart-phones, and with the arrow keys on laptops and desktops. 5. Onscreen controls will allow for adjustment of volume and robot height. 6. Still photos of what you can see via the robot can be taken by you at any time by clicking the camera icon on your interface. 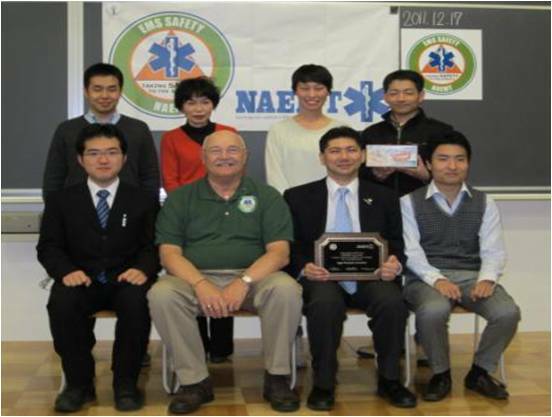 The ANB10(5) EMS Safety Subcommittee 2015 January meeting recording and handout are available here for gratis download! 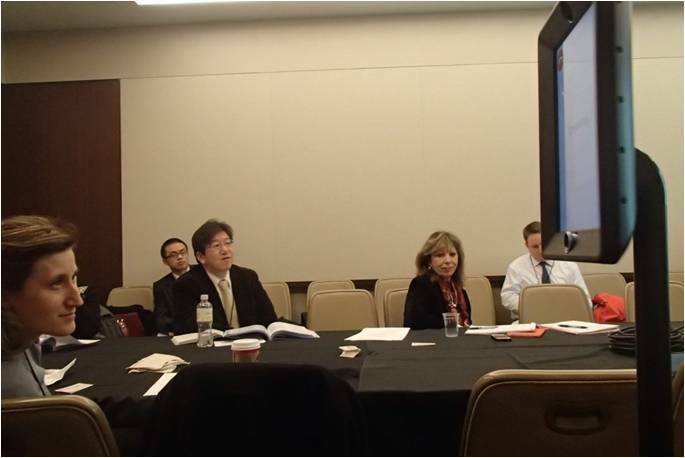 Here is the public access link to the ANB10(5) Jan 12 2015 Subcommittee meeting recording . And to the public access link to the ANB10(5) Jan 12 2015 Subcommittee handout . 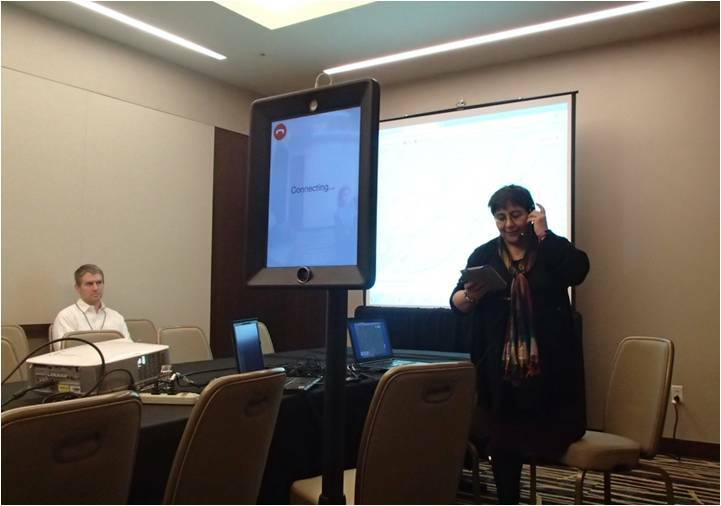 A first for the TRB - Andi, the new EMS Safety Foundation Telepresence Robot has been with us in DC to beam in speakers and share the experience. Andi - was a much phtographed highlight @ the Transportation Research Board's Annual conference in DC attending the subcommittee meeting, other sessions and the exhibit hall too. 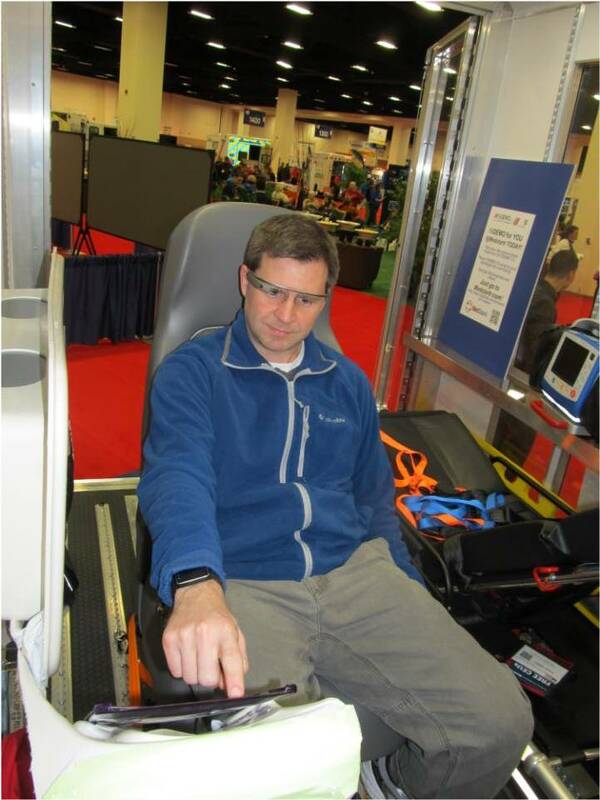 After an exciting visit to the Virginia EMS Congress - INDEMO was a hightlight @ EMS World Expo!! 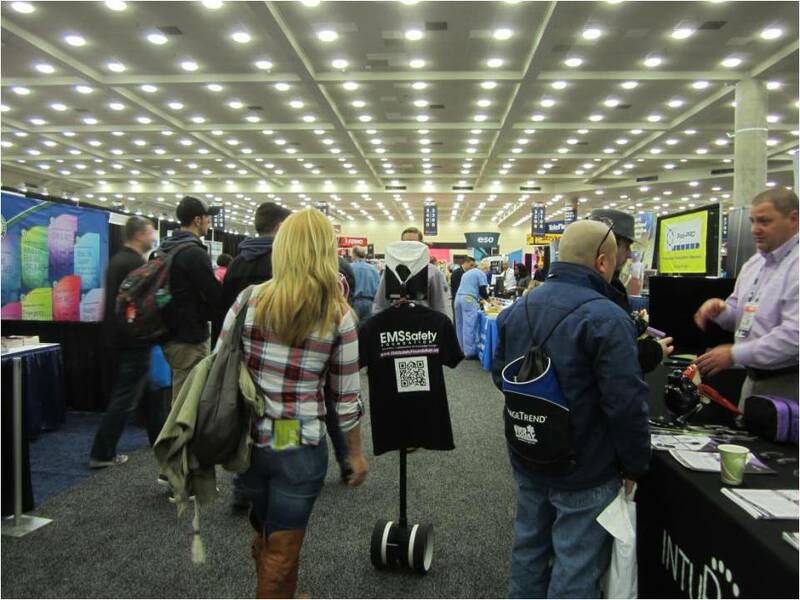 Many came to see, touch and interact with the INDEMO Project @EMSWorld Expo in Tennessee Novmber 2014 - as well as with the scale models giving you a configurable and hands on experience and the GoPro rooftop camera. 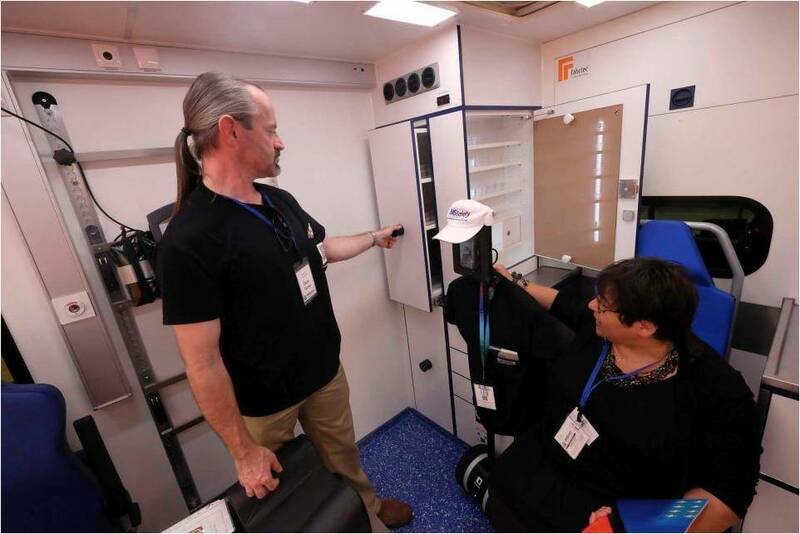 The Ambulance Safety Innovation Design Module 1.0, Ambulance Safety INDEMO 1.0 is a unique hands on demonstration ambulance rear compartment that is configurable so you can get the feel of being in a cutting edge rig. Integrating innovations from around the world for the north American market. Congratulations to the iRescU Project - A Winner in the AHA Innovation Challenge - THANK YOU for All your support for this project that is working to help to save lives with crowdsourcing, new tech and gamification! 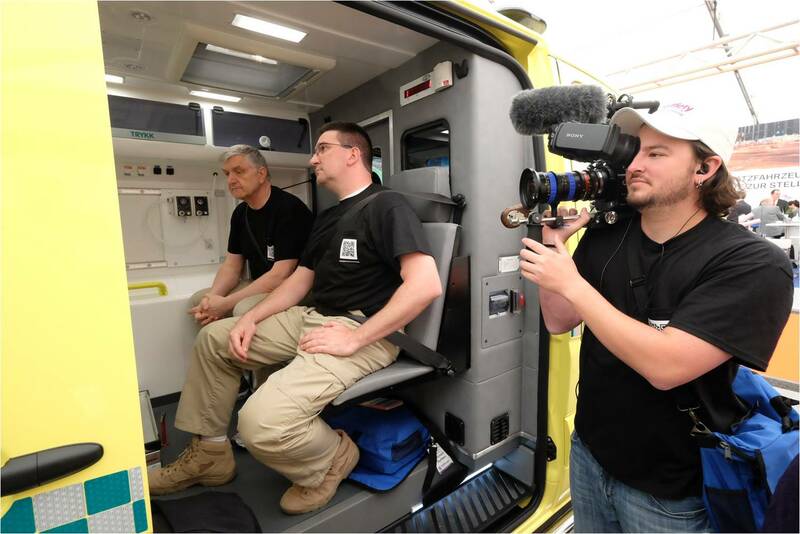 We have had a great team of folks participating in our Rettmobil 2014 Delegation May 13-16th - including for the first time - a film crew! We had the honor of having Ted Setla and Matt Price from Setla Films as well as JEMs editor AJ Heightman, and international EMS colleagues from three continents - and our technical experts. Here is the login for the recorded "Rettmobil LIVE 2014 !" Webinar Rettmobil LIVE 2014! Webinar Secure Login link . And here is a public access link for the "Rettmobil LIVE 2014 !" Webinar Handout Rettmobil LIVE 2014! Webinar Hand out . Welcome to the EMS Safety Foundation INDEMO Project ! And Google Glass meets INDEMO 1.0 !! Many folks are very keen to get their hands on the INDEMO 1.0 interactive environment to assist in getting better, safer and cheaper ambulance vehicles specced out. You can now get your services own personalized virtual tour of INDEMO 1.0, or even have INDEMO 1.0 come to your site/region for a workshop, as well as 3D blueprints and videos. 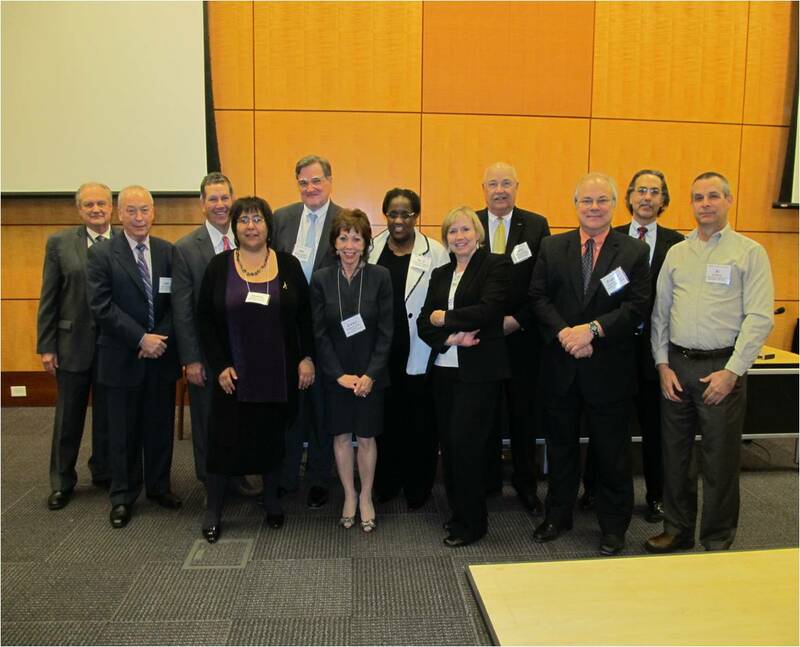 The EMS Safety Subcommittee of the TRB met in DC at the Annual TRB conference on Thursday January 16th 2014, at the Keck Center. We covered the new developments in ambulance transport safety and standards, and a number of new tech aspects of EMS Safety Innovation. Handouts to be posted . 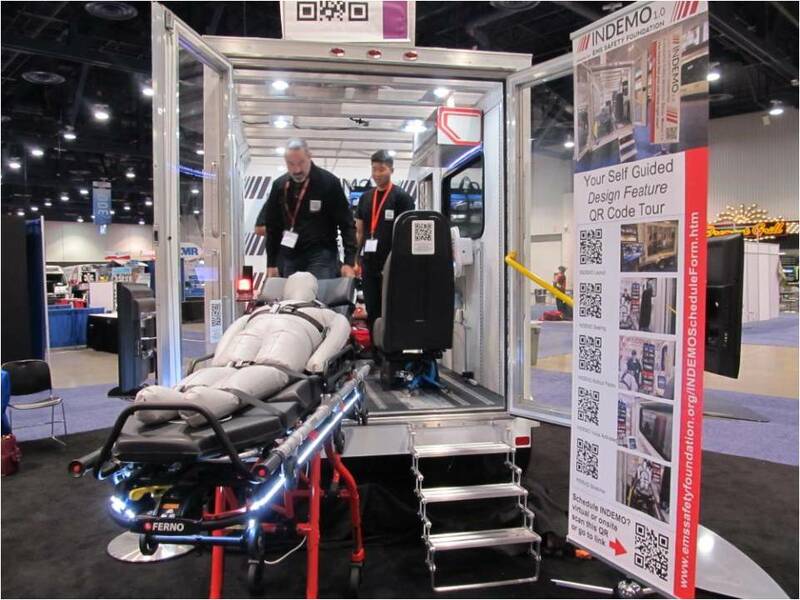 the EMS Safety Foundation Ambulance Safety Innovation Design Module 1.0 @ EMS World Expo, in Las Vegas Sept 10-12, a great success, generating much interest and attention. The Future that you can have RIGHT NOW!! 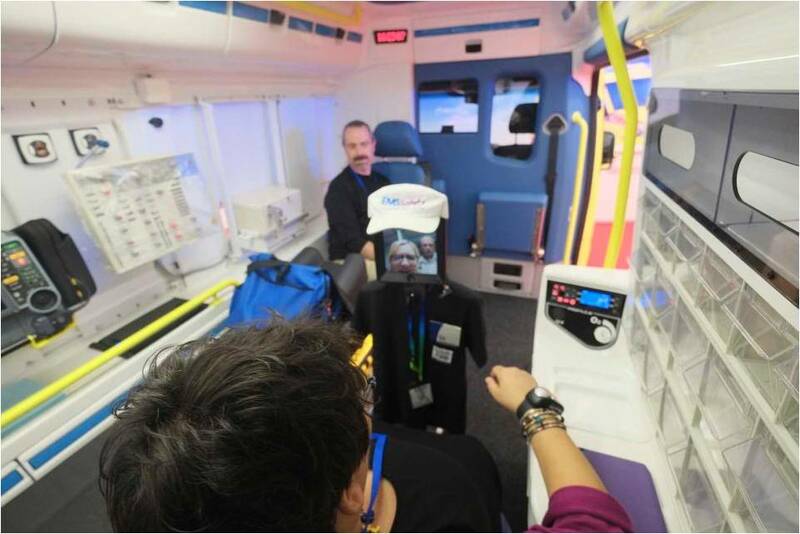 The Ambulance Safety Innovation Design Module 1.0, is a unique hands on model ambulance rear compartment that is configurable so you can get the feel of being in a cutting edge rig. Integrating innovations from around the world for the north American market. This is the future that you can have right now. 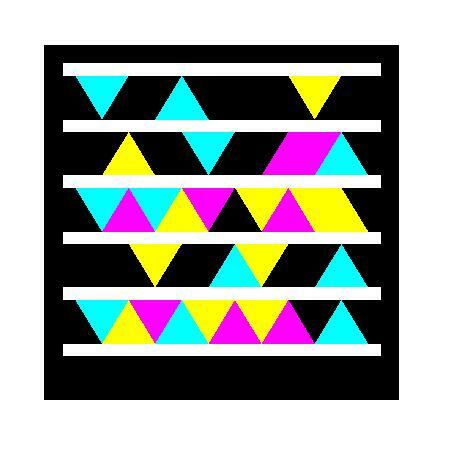 Designs so that you can do your work with optimum safety and efficiency. Based on state of the art science and practice and input from the world's leading experts in automotive safety and human factors. We have had a great team of folks participating in our Rettmobil 2013 Delegation May 14-17th - including as well as both EMS World and JEMs editors, Scott Cravens and AJ Heightman, international EMS colleagues from three continents - and our technical experts. Standby for blogs, video feeds on JEMS.com and EMSWorld.com. 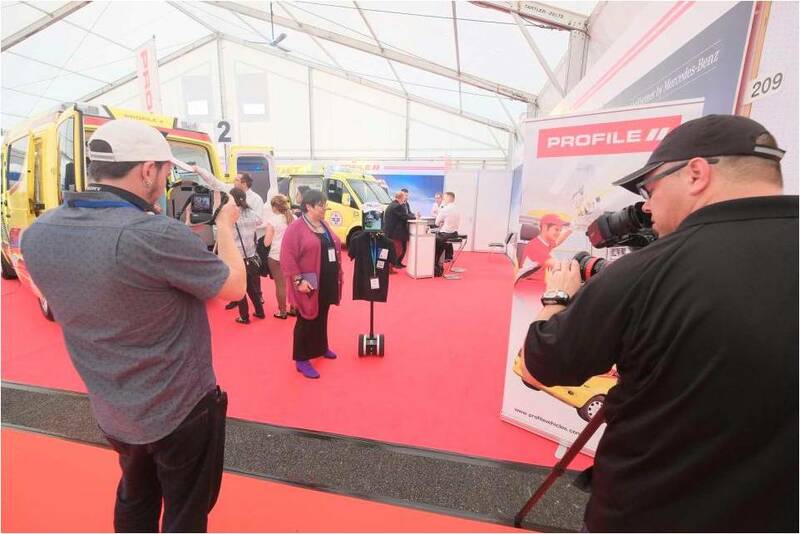 Our Rettmobil 2013 Wrap Up Webinar from Friday May 17th, covered many of the highights of Rettmobil Secure Login for the Rettmobil 2013 Wrap up Workshop Webinar Recording. A Youtube recording of this Webinar is posted here - for public access. this video trailer is masterfully edited by Kyle Bates. This video is public access information please share widely. on site at the Keck Center and online globally. 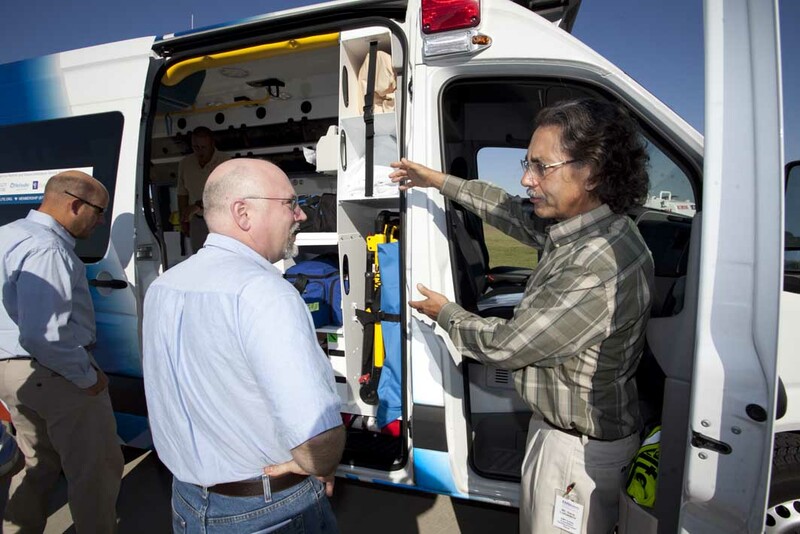 Bang for buck: Ambulance Safety, Standards and Survival - What do you need to know! 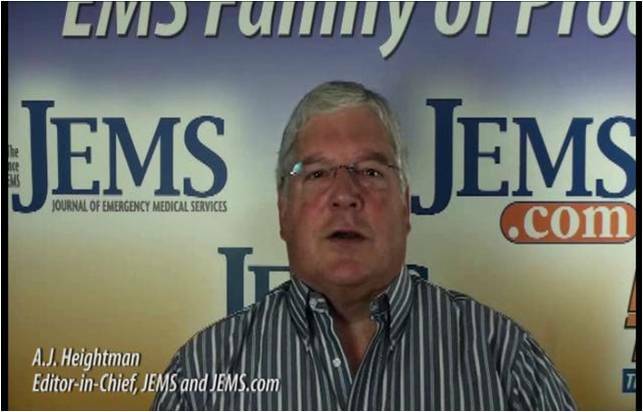 Much was covered in the recent EMS Safety Foundation June Webinar, including an overview of TRB 2012 EMS Summit synopses, Rettmobil 2012, NFPA 1917, EMS Safety Culture Meeting, NIST, White House initiatives Update, and the forthcoming EMS Expo events, and EMS Asia. Take a look at this Youtube outline below!! Here is a handout for the EMS Safety Foundation Delegation to Rettmobil 2012 You Tube video. 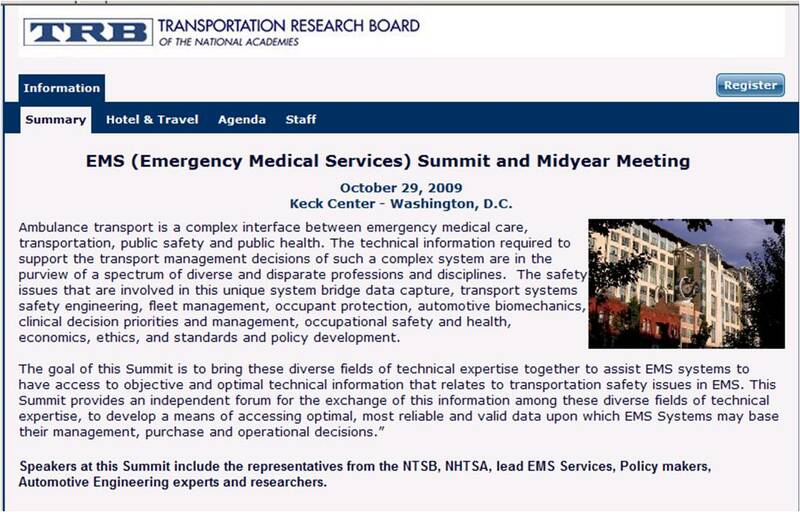 The March 2012 EMS Safety Foundation Webinar provides a comprehensive overview of the information packed National Academies 2012 TRB EMS Safety Summmit. 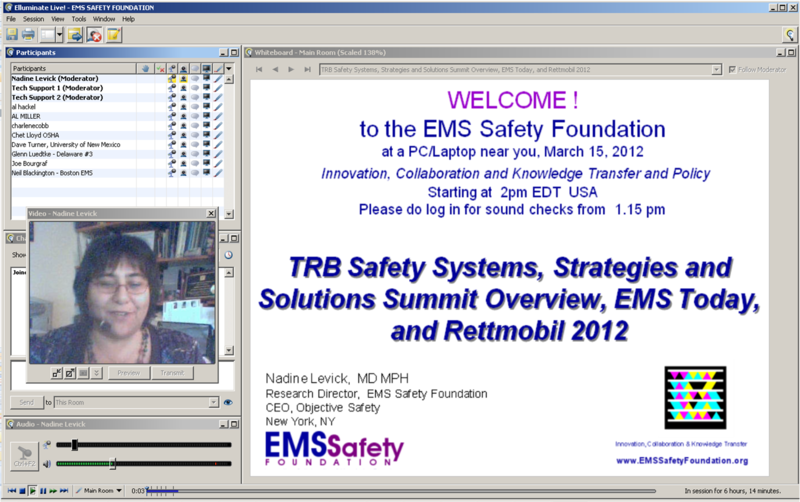 For the full EMS Safety Foundation Webinar synopsis of the 2012 TRB EMS Safety Summit, the one day TRB event is condensed into a 50 minute Webinar for public access. and with audio links accessable via QR codes on your smartphone or iPad 2 and new. Click on each presenters name to access the handouts, which are public access. - presented in honor of W. H. 'Bill' Leonard, who passed away unexpectedly in November 2010. 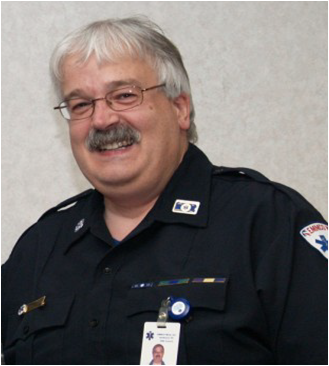 Bill had made a huge and lifelong commitment to EMS Safety, and the field of EMS more broadly over his life time. He is sadly missed by many. 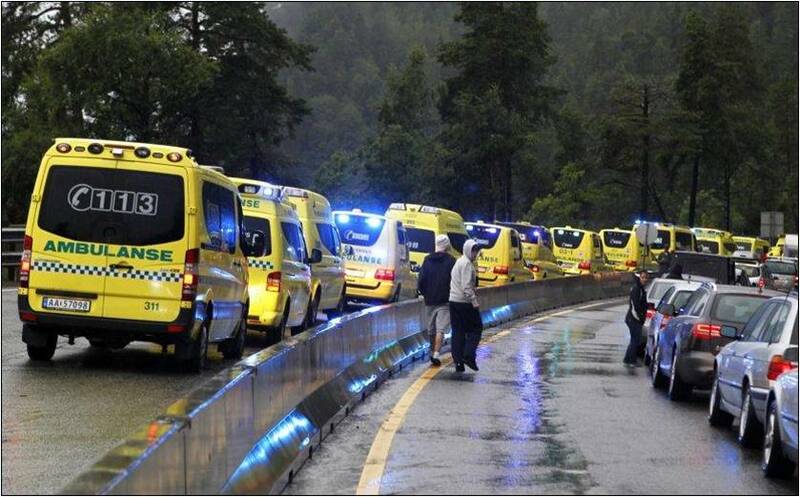 Ronald Rolfsen, an Advisory Board Member of the EMS Safety Foundation, and Advisor to the Oslo University Hospital Ambulance Service gave a remarkable, powerful and moving and very informative half hour presentation to the EMS Safety Foundation via Webinar from Norway December 12, 2011. A full recording of this presentation, handout and video is accessible publically at the link below or click the picture above. Am sure you will find it fascinating and of great relevance to the USA setting. 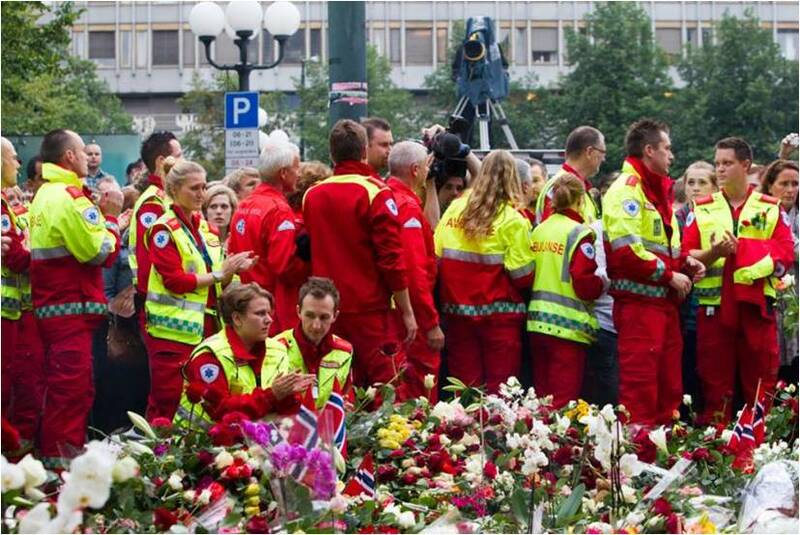 Please click on the above image to read an inspiring letter regarding the Oslo shootings sent to the EMS Safety Foundation July 26th, 2011, by Ronald Rolfsen, our special Innovation Consortium Member from Oslo University Hospital, Norway. 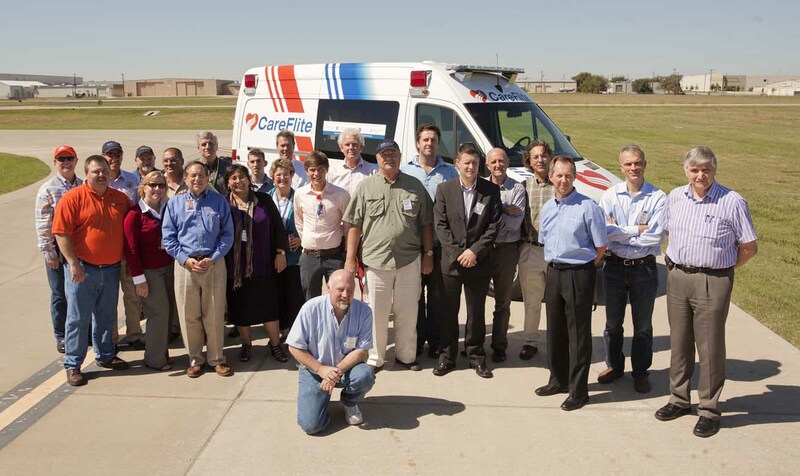 The EMS Safety Foundation held its first and hands on landmark Workshop event in Dallas on October 2nd, 2010, immediately following EMS Expo, hosted by Careflite . This Workshop brought technical experts in automotive safety and ergonomics together with innovators in EMS operations and ambulance manufacture. Attendance was packed, and a very dynamic and valuable experience for all. and joined in Post EMS Expo 2010 Workshop with the EMS Safety Foundation Innovation Consortium and their Technical Experts - found the activities of the Foundation eye opening, valuable and of great interest. 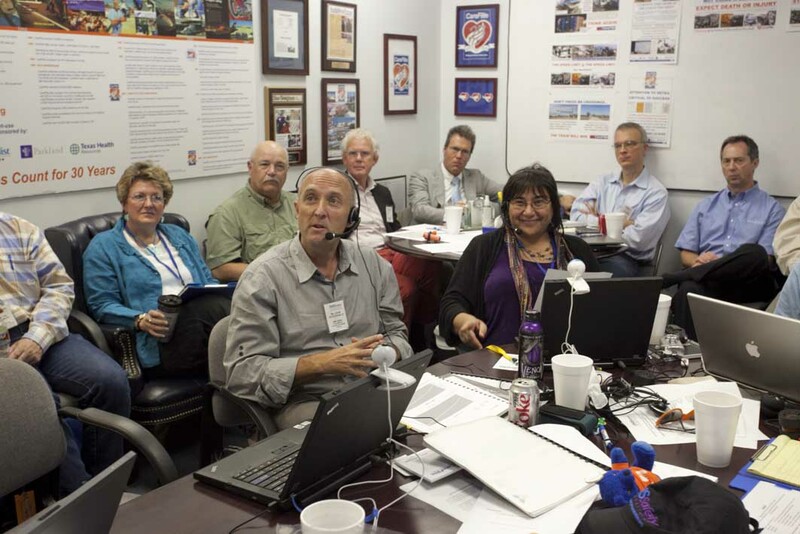 Innovation Consortium Technical Expert EMS Safety Foundation members have full access to Webinar recordings, handouts, Photos and Video of this informative event. Thursday May 12th, 2011 from the EMS Safety Foundation 2011 RETTmobil Delegation, from the EMS Safety Foundation Booth at Rettmobil 2011 in Fulda Germany. Thursday May 6th, 2010 from the EMS Safety Foundation 2010 RETTmobil Delegation, from the Dlouhy Booth at Rettmobil 2010 in Fulda Germany. The EMS Safety Foundation 2010 Rettmobil Delegation has been an exciting and eyeopening event - attracting global attention! With more than 20 delegates from the EMS Safety Foundation's Innovation Consortium, Technical Expert Panel, Advisory Board and Corporate Partners, it is again the largest non-European delegation participating in Rettmobil. 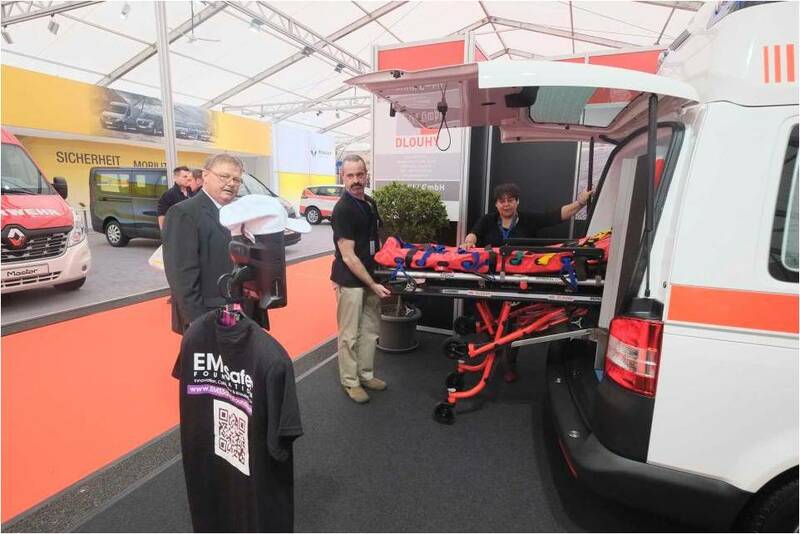 The Delegates had a very busy schedule in addition to all the Rettmobil activities and events, there were a series of 4 special EMS Safety Foundation Workshop/Webinars, including a live broadcast walk thru of a state of the art European ambulance. 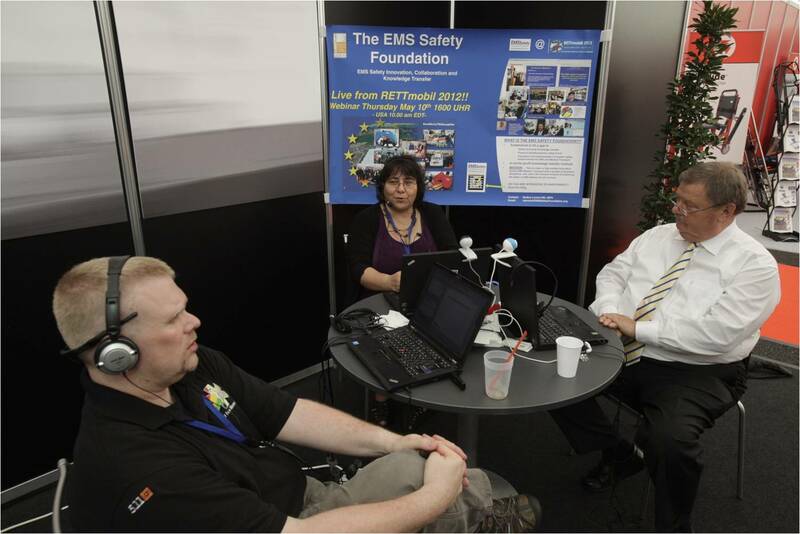 Links for the recordings of all the EMS Safety Foundation Retmobil 2010 events are avilable at this site for those who are participants in the EMS Safety Foundation's Innovation Consortium, Technical Expert Panel, Advisory Board and Corporate Partners. Click here for Final Program, Synopsis Webinar Recording and Downloadable Presentation Handouts. 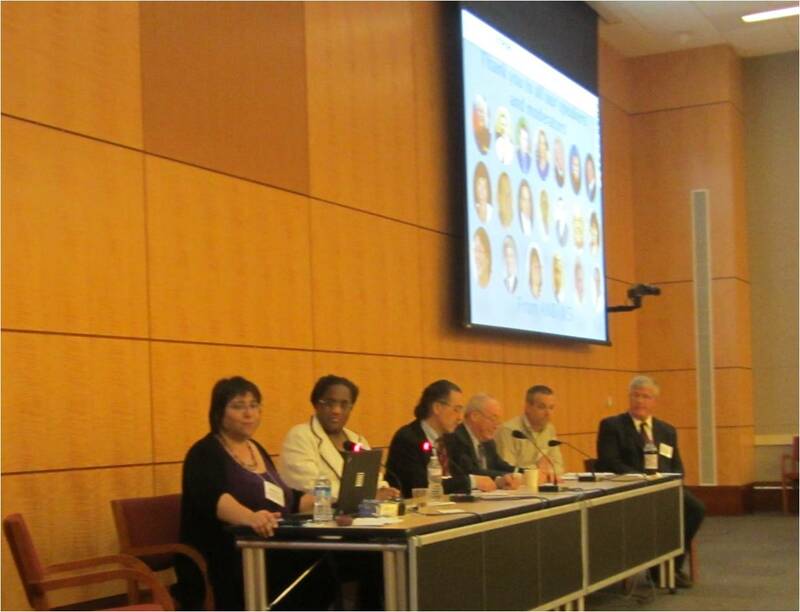 For last years 2008 TRB Ambulance Transport Safety Summit, click here for the recording and documents. Objective Safety is dedicated to EMS safety awareness and enhancing injury prevention and control. We are flexible, whether you are a small local urban service or in a rural setting, or a major EMS system - We provide tailored and specialized seminars, strategic safety and hazard awareness advice and evaluation. We can save you lives, time and money. Click the Resources Tab for a list of accessible information in print or electronic media.